Joined by Maddie and Tae as well as Runaway June, the pregnant singer belts out covers of classic country hits such as Dolly Parton’s ‘9 to 5’ and Shania Twain’s ‘Man! I Feel Like a Woman’. The 2018 CMT Artist of the Year took place at the Schermerhorn Symphony Center in Nashville on Wednesday, October 17. Honoring only female country musicians for the first time ever, the event featured a slew of stunning performances from the ladies, including Carrie Underwood and Pistol Annies. Pregnancy didn’t stop Carrie from taking the stage at the annual event. The “American Idol” winner led tributes to classic country hits by female acts, kicking off the set with a rendition of “Stand by Your Man” by Tammy Wynette. Maddie & Tae and Runaway June then joined her onstage to perform covers of others classics such as “9 to 5” by Dolly Parton, “Rockin with the Rhythm of the Rain” by The Judds and “Man! I Feel Like a Woman” by Shania Twain. 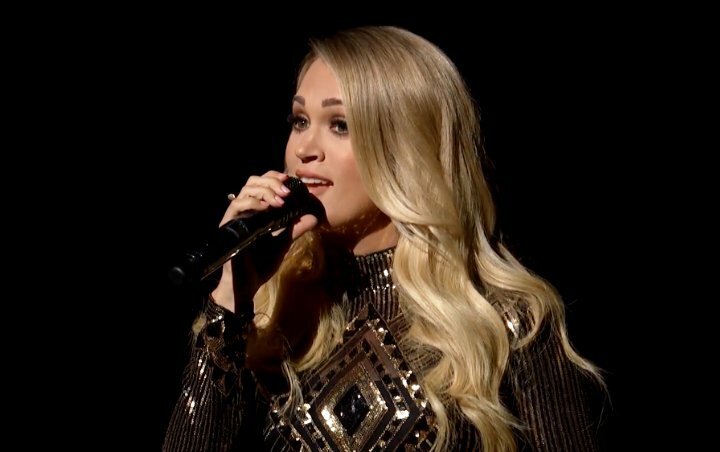 Carrie concluded the tribute set by performing her own song, “Cry Pretty”. Also gracing the stage for a tribute performance that night were Maren Morris and Brandi Carlile. Honoring the late Aretha Franklin, the two teamed up to belt out “Natural Woman”. Given that this was a country music event, they put a little bit country twist to the soul jam. Still, it was a performance that was worth watching for. Elsewhere at the show, Miranda Lambert brought her Pistol Annies bandmates for a performance of “Sugar Daddy”. Playing a tambourine, the blonde beauty showcased her dance moves while singing with Angaleena Presley and Ashley Moore. The song is going to be included on the trio’s upcoming album “Interstate Gospel”. Other performers who hit the stage at this year’s event were Kelsea Ballerini, Hillary Scott, Karen Fairchild and Kimberly Schlapman of Little Big Town. Sheryl Crow, Dierks Bentley and Martina McBride also joined forces to deliver a musical salute to Artist of a Lifetime winner Loretta Lynn.